I love time travel and to put it together with "What If" situation is what I call "freaking awesome." I don't really know why but this kind of book always makes me wonder about "what would happen if I could travel back in time and changing something in the past, does it always mean that the future will be better?" For me, the concept of time travel is always confusing and not to mention the paradox thing that comes with it. But you don't have to worry because this book made it really easy to understand even though the ending took me awhile to get it (and with the help of a friend). 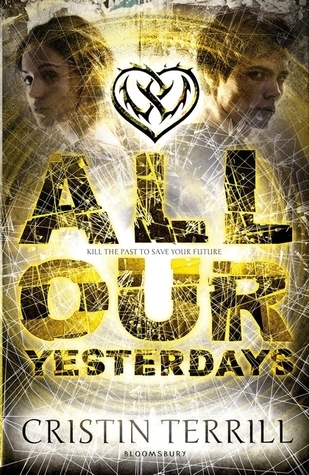 All Our Yesterdays is told from two perspectives (Em and Marina) so you will get the whole picture of what happens and why it happens as the story goes on. The characters are so complex and I loved to see how they've changed, how they've grown up from the young, innocent, carefree teens. Finn is my most favorite character. I liked his younger self and also his older self. About James, the younger James is so innocent. It's just sad that no one can see that the younger James needs help (he's not emotional stable). I think thing would be different if the younger James received the help. Reading this book is like putting the puzzle together, you have to get to the end to get the whole meaning. So be patient if sometimes you get lost or confused.